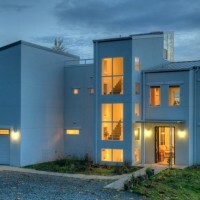 Designs Northwest Architects have sent us images of a house they designed in Stanwood, Washington. 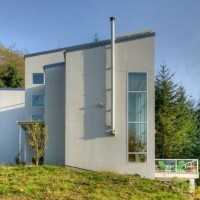 The Thomas Eco-House is located on an 11 Acre site in the Cascade foothills 0f Washington State. The house sits at the crown of a hill bordering on forestry lands and has territorial views of the surrounding wooded hills as well as views to Mt. Rainier and the city of Everett to the South. 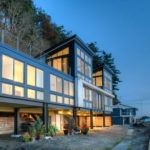 The house is four stories tall which allowed a larger amount of living space while maintaining a relatively small footprint and also takes better advantage of the views from the site. The site is landscaped with native vegetation which is irrigated in the dry summer months with rainwater runoff from the roof that is stored in a cistern. 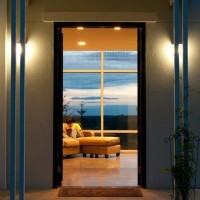 The client showed an early interest in energy efficiency and sustainable low maintenance design. These goals guided the entire design process. The house uses insulated concrete form (ICF) construction which consists of two layers of rigid form insulation between which concrete is poured. 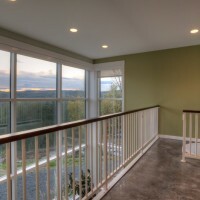 The insulation remains in place on both the interior and exterior creating a very efficient and airtight wall system. 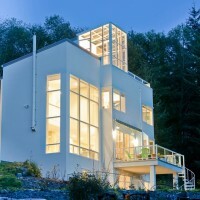 ICF construction results in a 44% reduction of required heating energy and 33% reduction of required cooling energy when compared to a wood frame house of equal size. 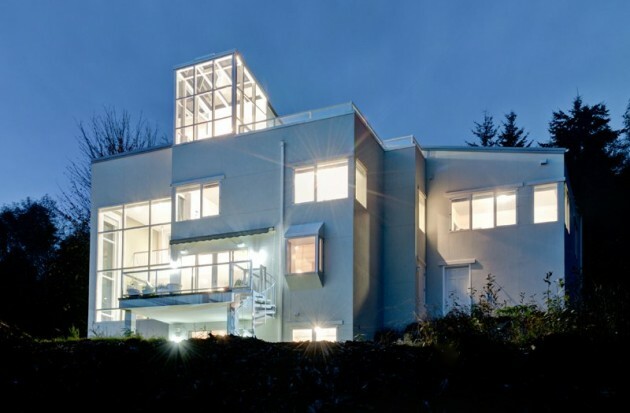 The ICF also allows for an easy application of stucco directly over the exterior insulation. This provides a durable long lasting and low maintenance finish. In order to improve efficiency for heating and cooling, the house uses a geothermal heat pump tied in with a hydronic heating system. The system uses air from a subterranean chamber which uses the insulating properties of the earth to provide a more stable temperature for operating the heat pump. A geothermal heat pump can be up to 45% more efficient than a traditional heat pump which uses ambient air. The heat pump is tied in with a high efficiency boiler which supplies heated water through a piping system embedded in the concrete floor. This hydronic heating system uses an estimated 30% less energy than an equivalent forced air system. The house is also wired to receive solar panels and or wind turbine energy though these were not installed at this time due to budget constraints. 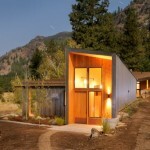 The house was also designed to take advantage of passive solar principles. A large bank of windows on the southern exposure allows solar penetration into the interior. The concrete floors act as a thermal mass that stores heat gain during the day and releases it slowly throughout the evening thereby mediating drastic temperature swings. On particularly hot days there are motorized solar shades which can be lowered to keep the sun out of the interior spaces. 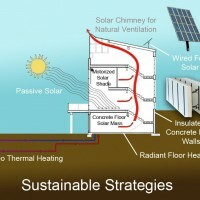 The stairway was also designed to provide natural ventilation using a solar chimney effect. 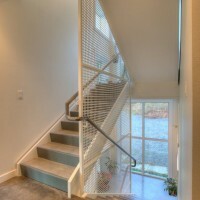 The “Bubble” located at the top of the stair has operable windows which, when opened, create a natural convection effect pulling warm air up the stair well and out of the house. 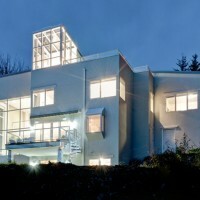 The Thomas Eco-House is divided by function between floors. 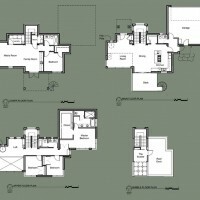 The main floor is occupied by general living space including Kitchen, Dining and Living Room. 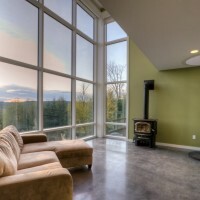 The floor plan on this level is open with floor to ceiling glass opening out to the views. The upper floor contains the sleeping spaces and a reading loft which opens to the living room below. 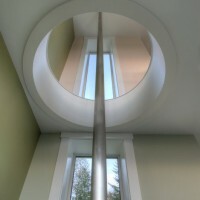 A fire pole provides a unique visual and physical connection between the two spaces. The stair tower continues upward to a special observation space nicknamed the “Bubble”. 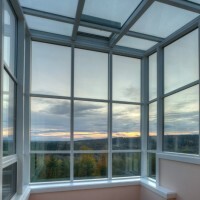 This area contains glass walls and ceilings which take full advantage of the expansive views and the night sky. 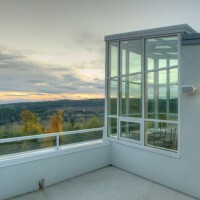 A roof deck is accessible from the bubble. The lower floor is a daylight level which has been arranged so that it can be used as guest quarters or as a mother in law apartment. 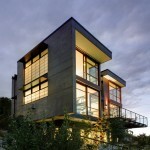 All four floors have polished concrete floors which add to the unembellished aesthetic of the house. The building forms are simple and follow the layout of the interior spaces reinforcing the overall strategy of efficiency that was the driving force behind the design. 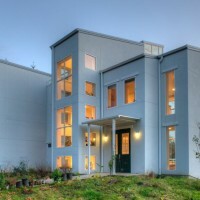 Visit the Designs Northwest Architects website – here.